Each of the above categories is quite self explanatory and can be used by the trader to access their trading history, open trades, transactions and other details. 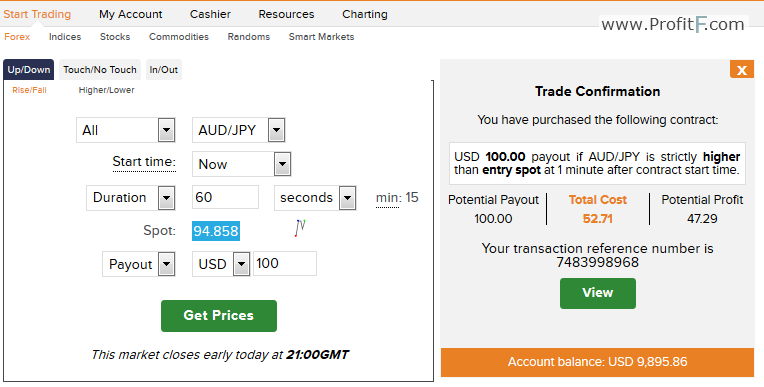 Cashier: The Cashier section allows traders to deposit or withdraw funds to their Binary.com trading account. Resources: The Resources section shows traders a snapshot of the various assets available to trade including trade details such as the typical payouts, trading times, as well as a special filter that shows the list of assets available to trade and their payouts. Based on the binary options type that a trader selects, the payouts vary. The picture below gives a snapshot. After a trader selects their preferred markets and type of contract, they can they choose from the various instruments available. Further options include the ability to select the start time, duration of the contract and the amount they wish to invest. Clicking on the ‘Get Prices’ button shows the payouts that are available based on the user’s selection and then opens a small chart with the trade details as shown in the next picture below. 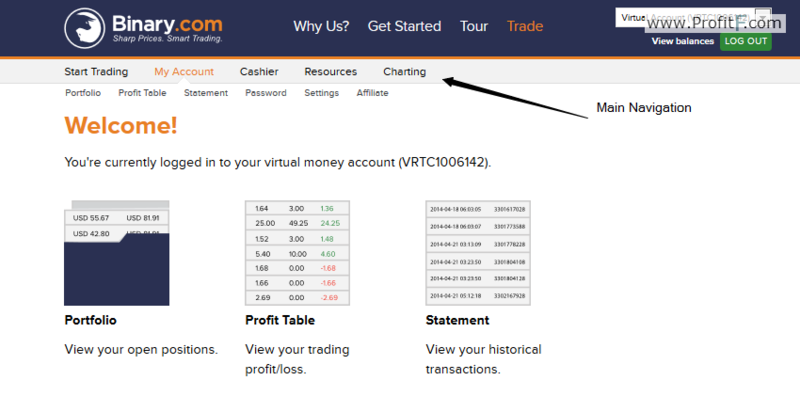 Binary.com also offers a stand-alone charting interface which can be accessed by clicking on the ‘Charting’ section from the main navigation section. 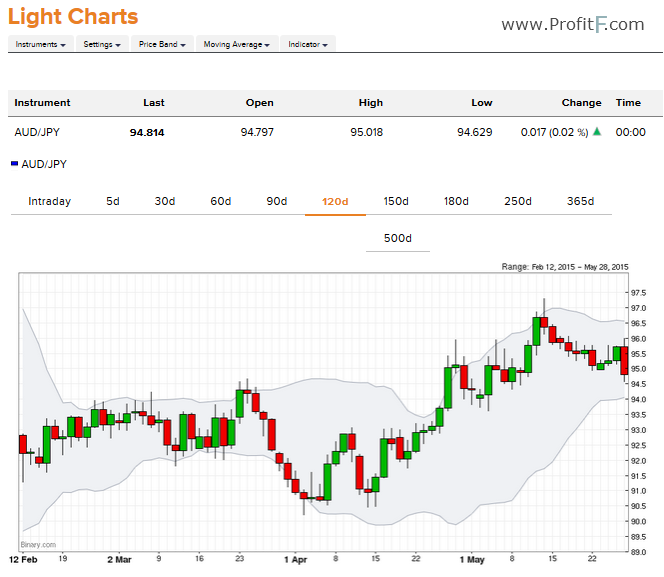 Java Charts (Requires Download): This is a downloadable charting interface that comes with additional functions such as drawing and trading indicators. However, traders will not be able to place any trades or binary options contracts directly from the charts. 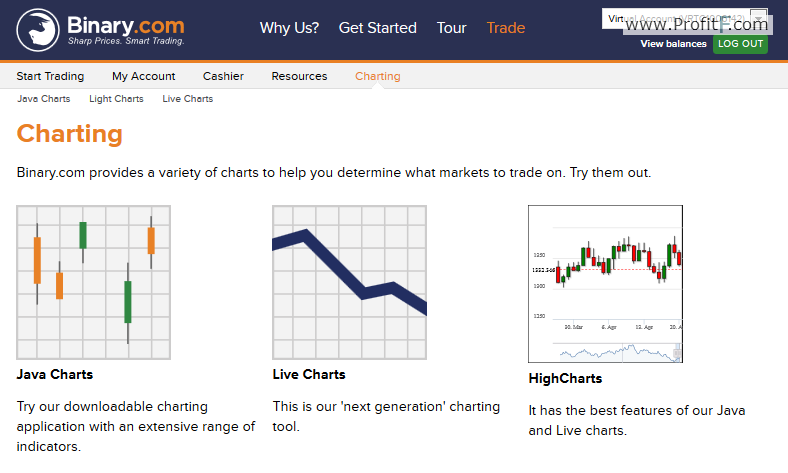 Live Charts (Browser Based): This is a basic charting interface that allows traders to view the chart for their selected asset or instrument. It is very basic and does not offer any additional functionality such as drawing tools or the ability to add any indicators. Overall, we find the Binary.com trading platform to be fairly advanced offering a good selection of charting options. The main drawback being that trading from the charts is not possible and therefore traders will have to switch between the different windows. Binary.com also does not offer any mobile trading apps and it is not compatible for mobile browsers either.